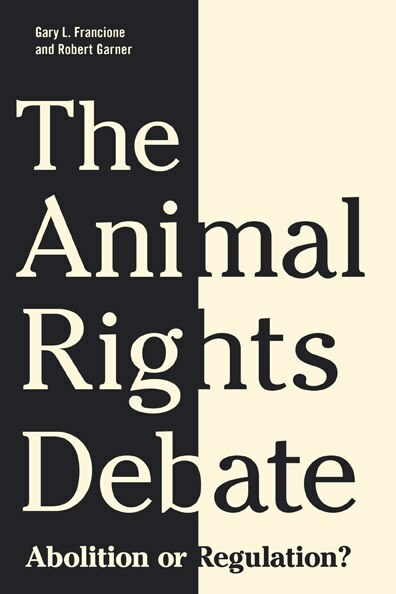 My newest book, The Animal Rights Debate: Abolition or Regulation?, will be published by Columbia University Press in November or early December. In the first section, I defend the abolitionist approach. In the second section, Professor Robert Garner of the University of Leicester (U.K.) defends the protectionist approach (what I refer to as “new welfare”). In the third section, Professor Garner and I discuss and debate issues such as the moral status of nonhuman animals and the efficacy of welfare reform. I hope that this book will help you to think through the issues involved and that it will assist you in your advocacy efforts. If you are not vegan, go vegan! Animal products are injurious to your health and animal agriculture is an ecological disaster. But most importantly, veganism is the morally right thing to do. It represents your daily celebration of nonviolence. http://www.abolitionistapproach.com/wp-content/uploads/2015/09/aa_logo.png 0 0 Gary L. Francione http://www.abolitionistapproach.com/wp-content/uploads/2015/09/aa_logo.png Gary L. Francione2010-02-24 00:09:282010-02-24 00:09:28New Book Coming Soon! Opposing Views posted my essay, On Violence. It generated a lively discussion with well over 200 comments. Read the various threads and make up your own mind. Unfortunately, there are people who identify themselves as animal advocates who claim that the solution to the problem of animal exploitation is violence. Some of these people have actually engaged in acts of violence against institutional exploiters. Others incite acts of violence by calling on people to use “intimidation” against animal exploiters or to make animal exploiters “fearful” of retaliatory violence. Putting aside the moral/spiritual aspects of violence, those who promote violence are deeply confused about the basic economics of animal exploitation. Institutional users engage in animal exploitation because the public demands it. Institutional users are, for the most part, indifferent to whether they are selling beef or bananas. They will put their capital wherever they’ll get the best return. Most people regard animal use as “normal” in the same sense that breathing and drinking water are considered as “normal.” They demand animal products. If you destroy ten slaughterhouses today, as long as demand remains, ten more slaughterhouses will be built or ten existing ones will expand production (and probably make production more economically efficient). If you shut down a supplier of animals used for vivisection, and the public continues to support vivisection, which it clearly does, then another supplier will emerge. So as a purely practical matter, violence is a strategy that cannot work. As long as animal use is regarded as normal and as not raising a fundamental moral question, nothing will ever change. But we are not going to get people to think about animal use through intimidation, fear, and acts of violence. Education, if it is to be effective, can never be violent; it can never seek to intimidate or make people fearful. It must open their hearts and their minds. The non-violent strategy is anything but passive; it involves our working actively, constantly, and creatively to shift a fundamental paradigm—the notion that animals are things, resources, property; that they are exclusively means to human ends. And it is clear that our efforts to educate are working. There is a dialogue emerging about the use of animals that goes beyond questions of “humane” treatment. There is a constant stream of stories about how people are becoming increasingly aware of the moral schizophrenia that characterizes the human/non-human relationship. Those who advocate violence are not only confused about basic economic issues, but they are hindering this progress because they provide an easy target that gives people an excuse to dismiss the issue of animal exploitation. In this respect, the pro-violence people are similar to those who promote sexism. Would Martin Luther King have campaigned for civil rights, claiming “I’d rather go naked than sit in the back of the bus”? Would King or Gandhi have urged us to “intimidate” others and to make others “fearful” that they were going to become victims of violence? Sometimes, when I see some of the things that the pro-violence people say or do (or when I see a video with a woman stripping “for the animals”), I shake my head and wonder what people could do that could be worse in terms of getting the public to take this issue seriously. Indeed, it seems that these people are trying to sabotage meaningful change. For further discussion of these issues, listen to the Commentary I did on this subject, or read A Comment on Violence, More on Violence and Animal Rights, and On Violence and Vivisection, all of which are on this site. I also discuss the issue of violence in my forthcoming book, which I co-authored with Dr. Robert Garner, The Animal Rights Debate: Abolition or Regulation?, which will be published by Columbia University Press in May 2010.